Collectively, participants shared 1,374 ideas, comments and votes. The conversation revealed three key barriers that seem to stop people from being more active. Our analysis of the conversation also suggested that confidence and self-belief are foundational factors that impact how people see all other barriers and opportunities. Upon deeper analysis, were able to break these barriers down into sub-themes, presented in the table below. We believe that interventions targeted at addressing each of these sub-themes will effectively help people to be more active. In fact, many contributions suggested specific solutions for these barriers. It is hard to do it alone It is hard to find the confidence and the motivation to exercise or join a leisure center all on my own. Lack of information I would like to be more active but I don’t know what exercises I am supposed to do, especially exercises that are appropriate for my health condition. Fear of being judged- I don’t like my body I am worried about my appearance. I have no confidence in my body. Fear of being judged- Lack of skills I am not confident in my ability to be active. 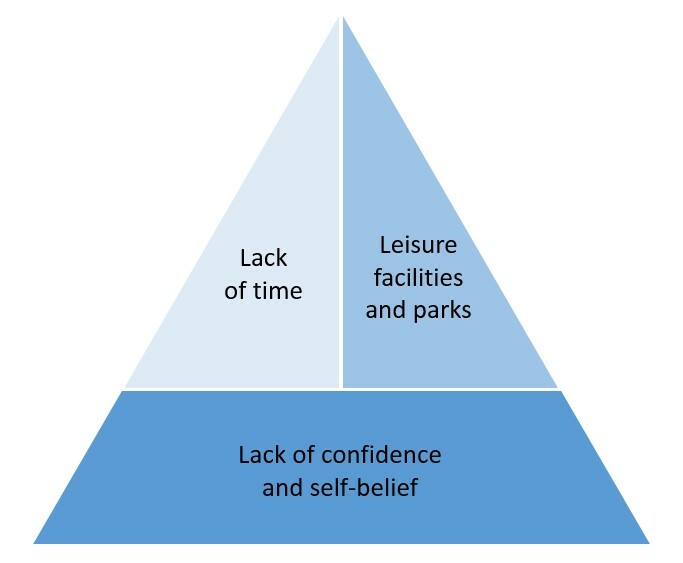 Perception of accessibility & availability I find it difficult to use leisure facilities because there are limited facilities close to where I work and live, and those that are in my area don’t have flexible opening hours that suit my schedule. Perception of safety and appearance Our public parks and cycling routes are not safe and well maintained, especially in some areas of Greater Manchester. Perception of expense I can’t afford to become a member at a gym or even council leisure facilities. Perception of my needs not being met I feel facilities do not accommodate my needs, such as providing childcare or spaces suited for people like me who have a mental illness. Seizing every opportunity to be active I am overwhelmed by all the demands of life and also fail to see my daily activities as an opportunity to be more active. Time management I don’t manage my time properly. clearly point to the need for applying human-centred design to communication campaigns, leisure facilities and interventions aimed at targeting specific conditions or groups.